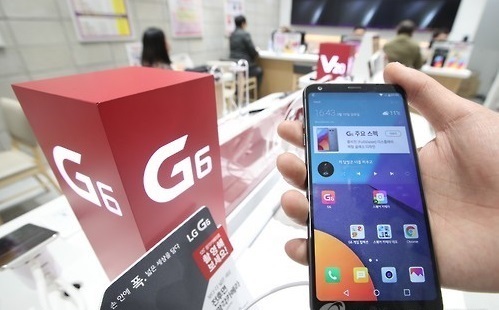 South Korean tech giant LG Electronics Inc. unveiled its test lab to the public for the first time to reassure customers of the safety of its flagship smartphone G6 and its battery, industry watchers said Sunday. The company last week took the press on a tour of its smartphone production line located in Pyeongtaek, some 70 kilometers south of Seoul, amid concerns about smartphone safety sparked by rival Samsung Electronics' Galaxy Note 7. Samsung suspended the production of the Galaxy Note 7 phablets last year due to battery problems that caused some of the devices to catch fire. LG conducted various tests on the G6, including penetrating the device with a nail, or dropping metal weighing 9.1 kilograms on the smartphone from a height of 61 centimeters. LG said the tests were to show that its products are safe even when they are faced with strong shock or when users' pets chew on them. While the devices were damaged from the experiments, they did not catch fire nor explode. LG said the company is conducting some 20 tests. "Smartphone batteries are like explosives. But a well-designed battery does not explode even when given a strong shock," an LG researcher said. Last week, industry sources said the LG G6 smartphone earned the "MIL-STD 810G" certificate from Maryland Electrical Testing, meeting the military certifications approved by the US Department of Defense. The G6 passed 14 tests, including temperature, humidity, vibration and solar radiation, proving itself as a suitable device for the military environment. Industry watchers said LG's safety promotion is intended to gain the upper hand ahead of Samsung's release of a new flagship product slated for this week. "We have been already conducting battery tests, which were also adopted by Samsung Electronics (after the Note 7 case)," an official from LG Electronics said. LG Electronics plans to start sales of the G6 in the United States on April 7, and expand the sales to Europe and Latin America down the road.